Scott W. Smith is a Battalion Chief for the Midlothian Fire Department. 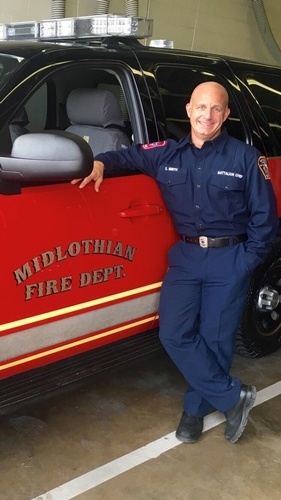 He began his career with the Midlothian Fire Department in September of 2004 and has promoted to the ranks of Fire Lieutenant, Fire Captain, and now Battalion Chief. As a Battalion Chief he is in charge of B shift and is responsible for hose testing, ladder testing, hydrant testing, 4-gas meters, PPE purchasing/ maintenance and fire education with the MISD elementary schools. Scotty is a state certified paramedic, holds Advanced Structure Fire Fighter, Driver Operator - Pumper, and Advanced Fire Inspector certifications from the State of Texas. He will be taking the state certification test for Fire Service Instructor in July. He will complete his A.A.S. degrees in Fire Service Administration and Fire Protection & Safety Technology this year. He has been accepted to Texas A&M San Antonio to obtain his B.A.A.S. of Fire & Emergency Service Administration. He is an ordained minister with the Disciples of Christ and is proud to serve the community that he has called home since 2012. His greatest reward is giving back to the community that has given him so much over the years.